The computer technology has transformed how we live, socialize, do business and even take care of ourself today. Thanks to recent innovations in the mobile, Internet and web/software development technology, we can enjoy our life as we do today. These innovations are made possible by computer technology which is largely driven by the advance in the field of computer science consisting of many sub specialty areas. For M.Sc. in Computer Science, the Faculty of ICT offers highly technical courses which are foundation to the field of computer science. We target hands-on students who would like to become experts in the field of software development, data science, network administration, computer and security, and computer graphics. Due to the establishment of the M.Sc. in Cyber Security and Information Assurance and M.Sc. in Game Technology and Gamification programs, the M.Sc. in Computer Science program now focuses more on software development, software engineering, database management, artificial intelligence, and data science. The M.Sc. in Computer Science program is a two-year program. The candidate is required to have knowledge and skills in computer science or related areas in order to be admitted to the program. Computer science and IT skills are important for workers today to help drive the country forward. Thailand has initiated the policy of evolving Thai industry towards industry 4.0 era which rely on knowledge and automation. With the competency in computer science, the goal of reaching industry 4.0 level can be realized. If you are interested in being a part of this initiative for modern and cutting-edge industry and business, the computer science program is right for you. Students will study at Mahidol University for 24 months (2 years) consisting of 2 semesters per academic year. Students in the Master of Science Program in Computer Science will study at the Faculty of ICT building, Mahidol University (MU), Bangkok, Thailand (Phayathai Campus). Classes are taught in the evening of weekdays (18:00 – 21:00) or during the day of weekends (9:00 – 16:00). Complete at least 25 credits of courses (16 core credits and 9 elective credits) including 12-credit thesis within 5 years with GPA at least 3.0. Pass the English requirements of the Faculty of Graduate Studies, Mahidol University. Successfully propose and defend thesis. Publish a part of thesis findings in international conference or journal (see details at the website of the Faculty of Graduate Studies). Complete the soft skills training requirements of the Faculty of Graduate Studies. Complete at least 31 credits of courses (16 core credits and 15 elective credits) including 12-credit thesis within 5 years with GPA at least 3.0. Successfully pass the comprehensive examination. Successfully propose and defend research project/thematic paper. The structure of the entire program consists of 4 semesters (2 semesters per year). The number of credits required for graduation depends on the plan of study. Plan A or thesis track requires a student to complete 16 credits of core courses and 9 credits of elective courses in addition to the 12-credit thesis. In order to graduate, the student needs to successfully defend his/her thesis and publish parts of the thesis in an international conference. Plan B or project track requires a student to complete 16 credits of core courses and 15 credits of elective courses in addition to the 6-credit research project. In order to graduate, the student needs to successfully defend his/her research project and pass the comprehensive examination. Students enrolled in this program can choose to study either Cyber Security track or Information Assurance track. Topics which are covered by each course are provided below. Master-level scholarship is available on a case by case basis. Scholarship will be awarded to students who have good academic background, career experience, research experience, computer science skills, English skills, and health. Since the master-level scholarship requires recipients to work as teaching/lab assistant or programmer/system engineer during office hours for a certain period of time during study and after graduation, the recipient must be able to work during day time and after graduation at the Faculty of ICT. In accordance to tuition fee announcement, the scholarship may include one or more of the following items: tuition fee, equipment fee, research fee and monthly allowance. Student exchange scholarship is awarded by the International Relation website. 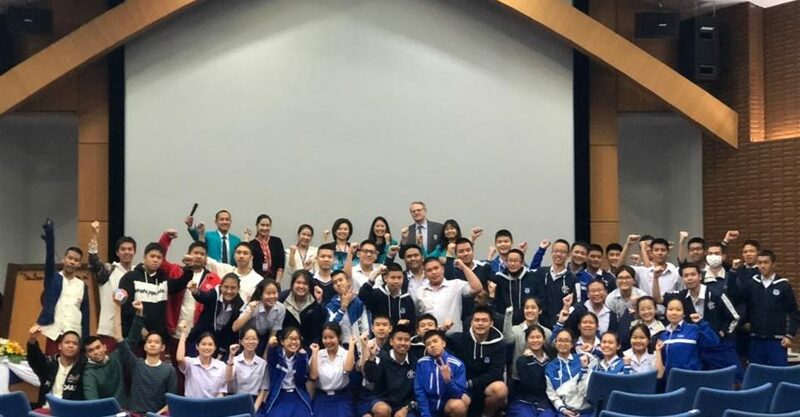 Mahidol University provides support for students seeking opportunity abroad for a period of time. Please see the website of Mahidol University International Relation division for more information (e.g. how to apply, amount of support and qualifications). Partial research scholarship is awarded by the Faculty of Graduate Studies for foreign students. For more information, please visit the website of the Faculty of Graduate Studies for more information. The tuition fee and scholarship information may be changed without notice. Please refer to the official announcement from Mahidol University and the Faculty of Graduate Studies. Have Bachelor of Science Degree in Computer Science, Computer Engineering, Information Technology, Electrical Engineering, or computer-related from any of the Ministry of Thailand’s accredited universities. Exceptions can be made for students who have a Bachelor degree with at least 18 credits of computer-related courses or have at least 3 years of work experience in the technical IT related area. Go to website of the Faculty of Graduate Studies to submit your application online. Register and login to the online application system. Complete the application form and submit related and supporting documents to the online application system. Why Studying at Mahidol University? Mahidol University is internationally known for its strength in research and education. Graduates from the university contribute greatly to the society. The state of arts educational and research infrastructure propel the university to the regarded as one of the top educational institutions in the Thailand. Mahidol University is selected to be one of nine Thailand’s National Research Universities. The educational environment and recreational facilities support students to fulfill their academic ambition.